Being an interior designer for over 25 years I’m quite familiar with the most common mistakes most people make (even some professionals) when decorating a home. Decorating should reflect our taste and style, and it is a very personal thing. However there are a few decorating blunders that should be avoided. Below is a list of mistakes and fixes. MISTAKE 1: The Line Up…lining up the furniture on one wall. 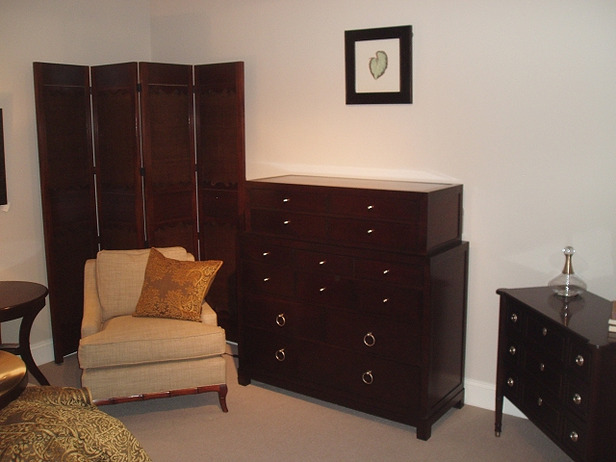 I see this done a lot especially in bedrooms, where several different size dressers are all shoved against one wall. This creates a “cluttered” look and feel. It’s also unbalanced. THE FIX: Be sure to measure the space and the dimensions of the furniture you’ll be placing on each wall. Place one main piece of furniture on a wall. You want to make sure the room looks and feels balanced. Also, be sure to leave enough “walk room” between the bed and the furniture. You don’t want to be bumping into things if you get up in the middle of the night to use the bathroom. Scale is very important here. MISTAKE 2: Furniture Placement…many people think pushing the living room sofa against the wall and by having the open space in the center of the room will make the room appear larger…False. This type of arrangement makes it difficult to carry on a conversation. Some rooms are too small for this configuration, if you have to place the sofa against a wall be sure to group the other pieces around the sofa…don’t push the chair against another wall, etc. Upon entry you see the back of the sofa…that’s a great place for a console table to be placed with a few accessories displayed. MISTAKE 3: Fear of Color…when I first moved to the dessert I was shocked at how many beige / cream colored houses I went to. Floors, walls, ceilings and furniture were all beige, which tends to look boring and lacks creativity. Many of the clients told me that they love color but were afraid to use it. Many think using a paint color, other than off white; will make the room look smaller and be difficult to match with furniture. THE FIX: Use your favorite colors! I recommend selecting the upholstery and window treatments first. You can start with a palette of three colors in different shades and contrast – you can have one dark deep color, complimented by lighter colors. Select the main color followed by accent colors. Darker colors tend to ground while lighter colors tend to float. Don’t use all jewel tones or pastels – mix it up. After those selections are made then the paint color can be selected. It is best to select a few colors and paint them on the wall in the room. Stay with it for a day or so and see how the color looks in the natural light and nighttime light, then select. 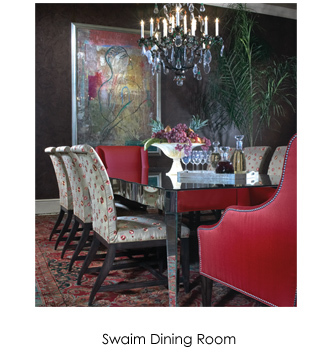 The goal of paint color is to enhance the other colors being used and to create a mood. You can use paint color to make something pop or to create a soft glow. But always surround yourself in the colors you love. MISTAKE 4: Too Many Patterns… using too many patterns can become distracting to the eye, busy and overbearing. However, you don’t want to be “matchy-matchy” either. There are many ways to introduce patterns to the décor of a room but there is also a fine line with how many to use and where. THE FIX: I love to decorate a room with different patterns, it creates interest. However, you must stay true to your color palette and plan. Use patterns and prints very specifically to support the main color and draw attention to the accent colors. Mix it up with a blend of solid colors, prints, different textures and materials. MISTAKE 5: Hanging Artwork Too High…you shouldn’t have to strain the neck and eyes to view art. In most situations art should be hung at eye level for proper viewing and balance. THE FIX: I see this mistake often, art being hung way too high. Art needs to be hung at eye level; the main feature of the art (or center) should be at eye level. Since we’re all different heights, you can use this as a guideline…hang art approximately 60” above the floor, 8”–12” above a sofa, chair or headboard. 6” – 8” inches for a mirror above a chest. In contemporary settings I prefer to hang art a little lower than in traditional settings. But don’t go too low because that doesn’t look good either. MISTAKE 6: Hanging Window Treatments Too Low…I see this mistake often too. 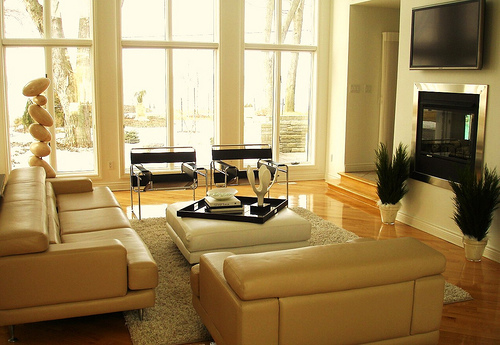 In most homes the art is hung too high and the window treatments are hung too low. THE FIX: I consider window treatments “jewelry” for the window. The goal is to dress up the window, add some bling and drama. Therefore you don’t want to stay in the constraints of the window size. The higher the curtain is installed the taller your room will appear. Hanging drapes at ceiling height will give a dramatic effect on the entire room. For the length, go ½” to 1” above the floor or make the drapes longer to “puddle” on the floor for a little drama. If you don’t want to go to the floor, than go just below the window molding. (in some cases you can touch the window sill) I don’t like drapes ending midway on a wall because it looks like you ran out of fabric and the flow is wrong. MISTAKE 7: Too Many Knickknacks…I think it’s important to display personal collections, things that you love to look at or have sentimental value. However, you can’t display all of them or have collections displayed in too many places, it becomes too messy and cluttered looking. THE FIX: If you do have a collection of knickknacks that you want to display select one area, cabinet or wall and display a few of your favorites. You can store the others and rotate them seasonally. It’s important to use accessories when decorating to bring the room together, to add some bling and drama but again don’t add too many. It’s best not to have too many small items on display. Instead use fewer but larger pieces that add impact and create drama. It’s important to have “negative space” so you don’t have to cover everything with a knickknack. In most cases…LESS IS MORE! When decorating a home it’s imperative to have a plan and budget. When you have a plan and budget you’re going to make better decisions and purchases. I find that most people struggle with scale and proportion when selecting furniture. Use books, Internet and furniture showrooms to gather ideas and to get familiar with what works. Visualization is difficult for most people and if you’re really stuck it is best to call in a professional. In the long run you’ll save time and money but most important you’ll get the job done right. Hiring a professional can turn a stressful project into an enjoyable one!